Yes, desert wedding celebrations are for real! While all the celebrities may choose romantic destinations like Italy, Switzerland, and France for their wedding, there are some who choose to wed at the most offbeat places. 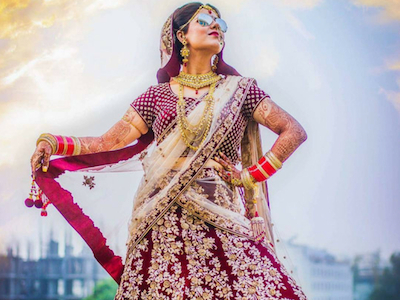 We have found one desi couple who is setting up weddings goals in India for all the right reasons. 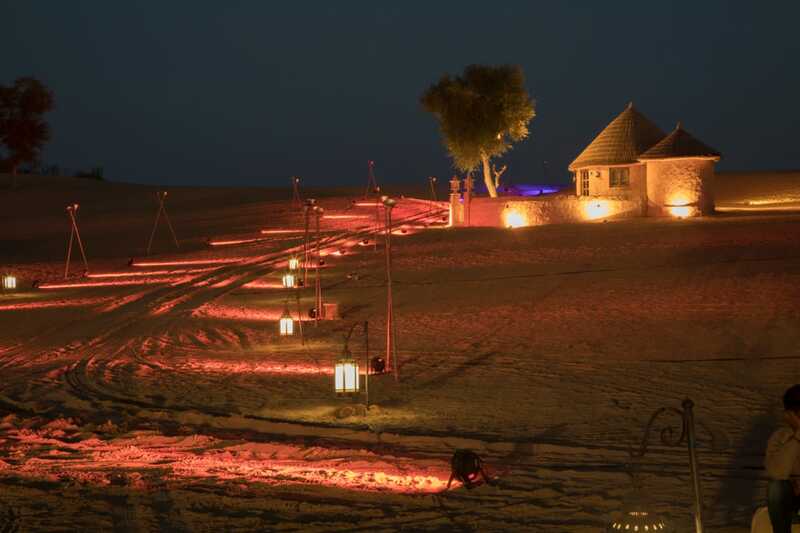 Annushree and Vinay had a dreamy Sangeet ceremony amidst the sand dunes. 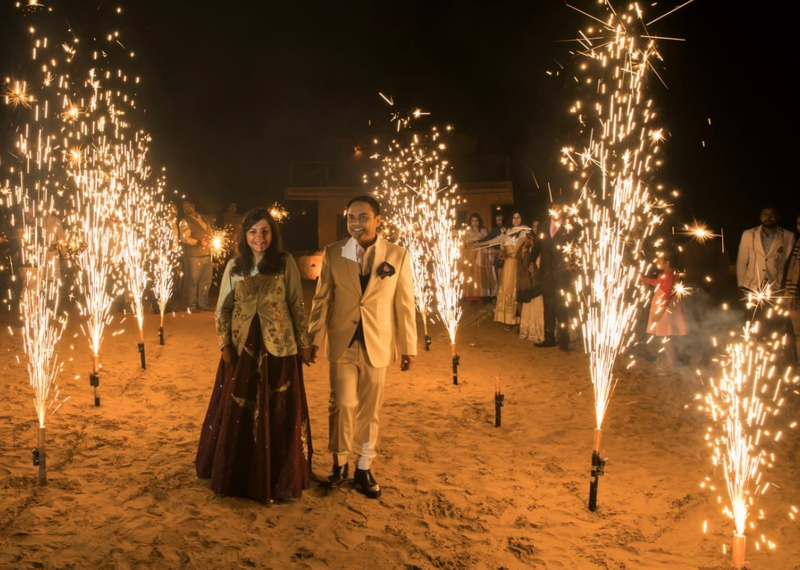 Their love for deserts became the guiding light for their wedding planner, Theme Weavers who catered more than what was expected. 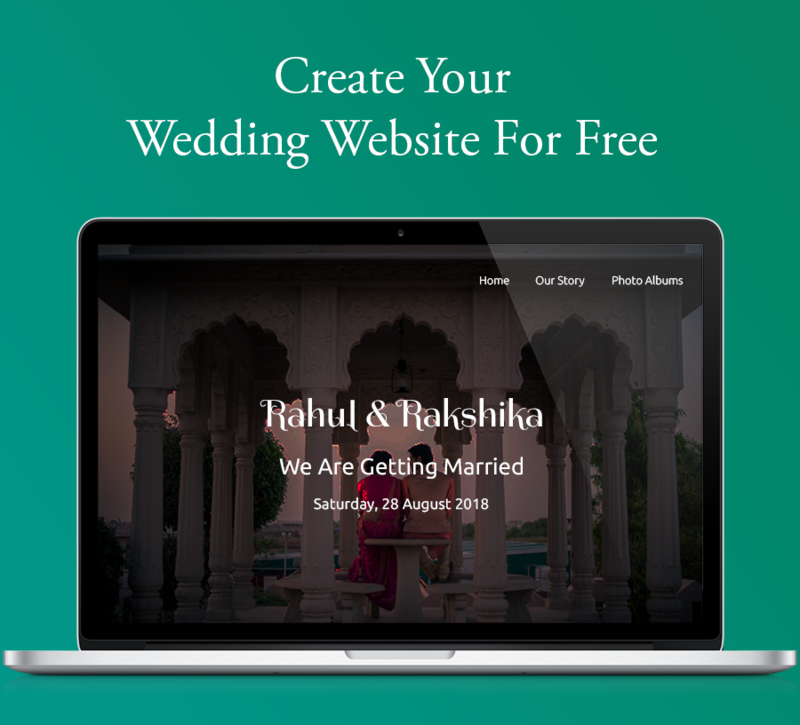 Interestingly, the bride is the director of this wedding planning firm, which made everything very smooth. 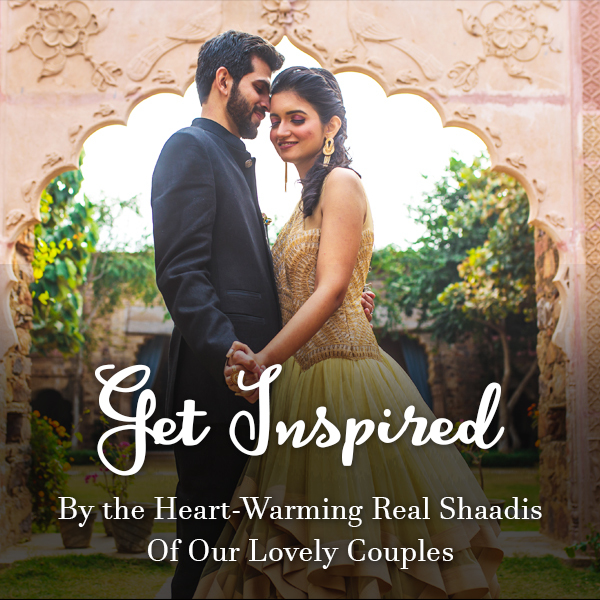 Just one look at their sangeet ceremony and your childhood memories of the Arabian Nights will come running back to you! 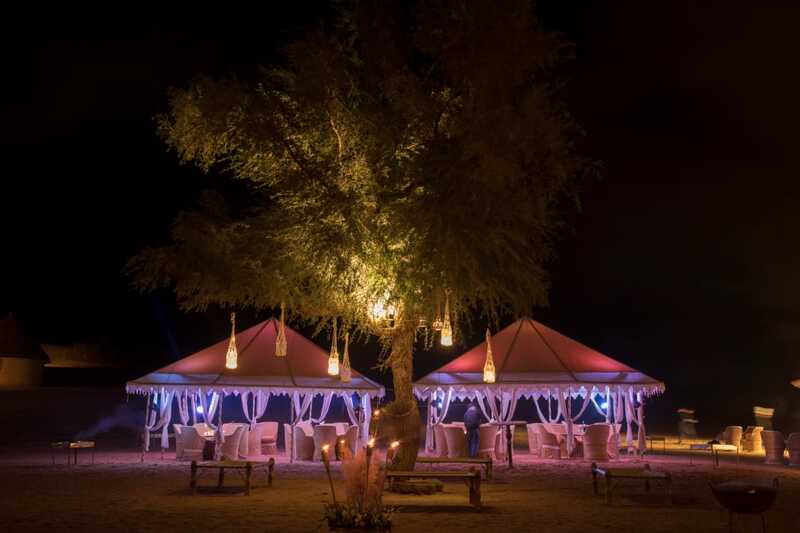 So, come, be a part of this adventurous desert wedding celebration, which was beautifully planned by Theme Weavers. Beaches, mountains, and plains are the most common wedding destinations but choosing a desert over these locations was very different. Anushree and her business partner, Prerna have always been very fond of deserts. They have always had a soft corner for deserts as the two are from Jodhpur. 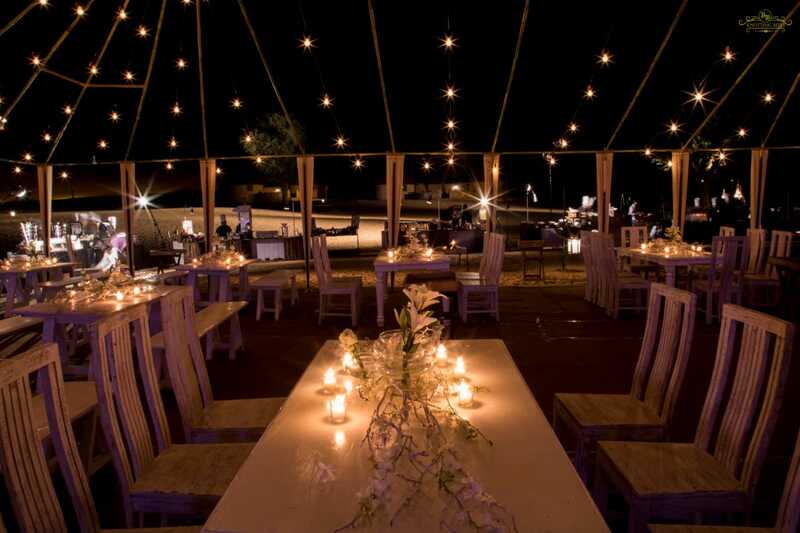 Desert weddings give you the opportunity to be as creative as you want to be and there are no time and sound restrictions in the middle of the desert. You can party as long as you want to. Anushree explained that deserts are very versatile. Even with minimum efforts, they look authentic and glorious. 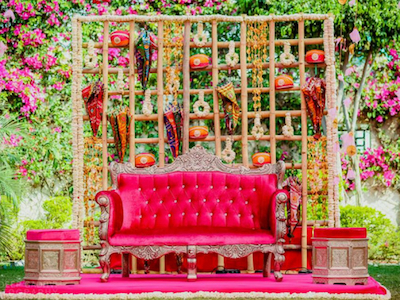 The desert wedding decor was a fusion of the old-world Rajasthan and the latest trends in the decor. 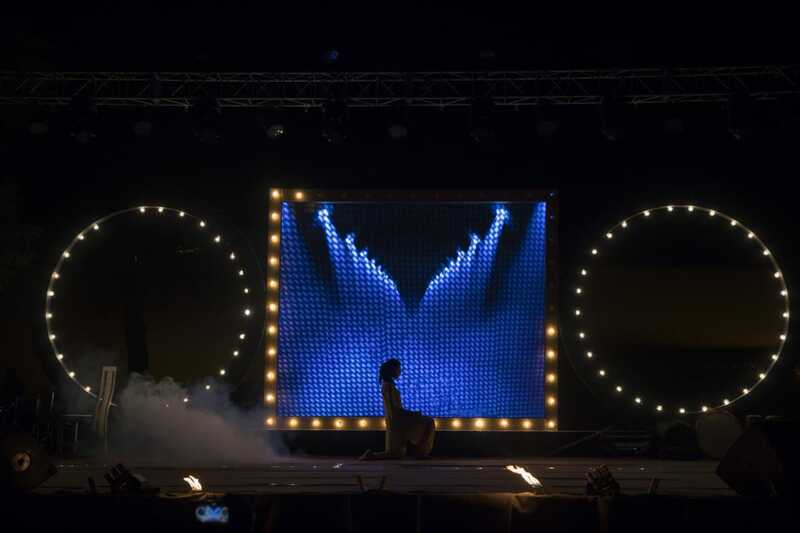 We loved how different types of lights were creatively used for illuminating the dark desert. They used warm tones to highlight the path for the couple and the guests and cold tones of pink, purple and blue to brighten-up those old-style huts. 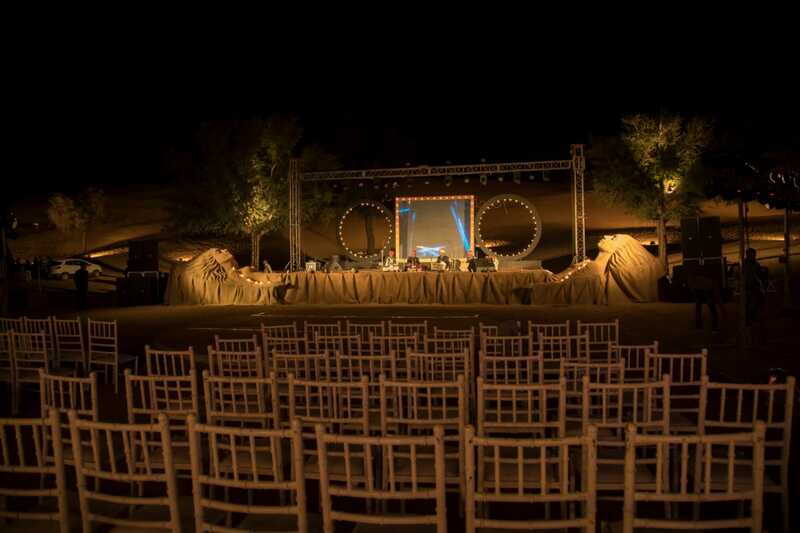 The intelligent use of LED lights gave the sangeet ceremony a rustic touch. 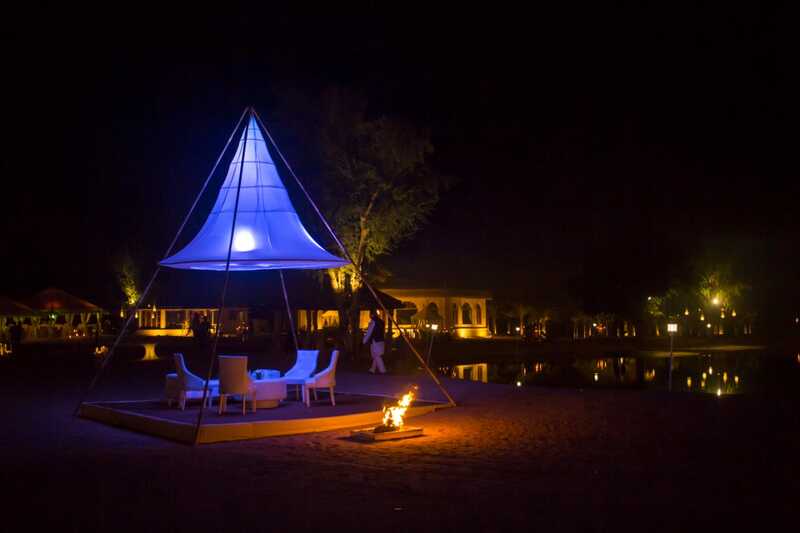 As deserts can get extremely cold at night, bonfires were placed all over the venue. 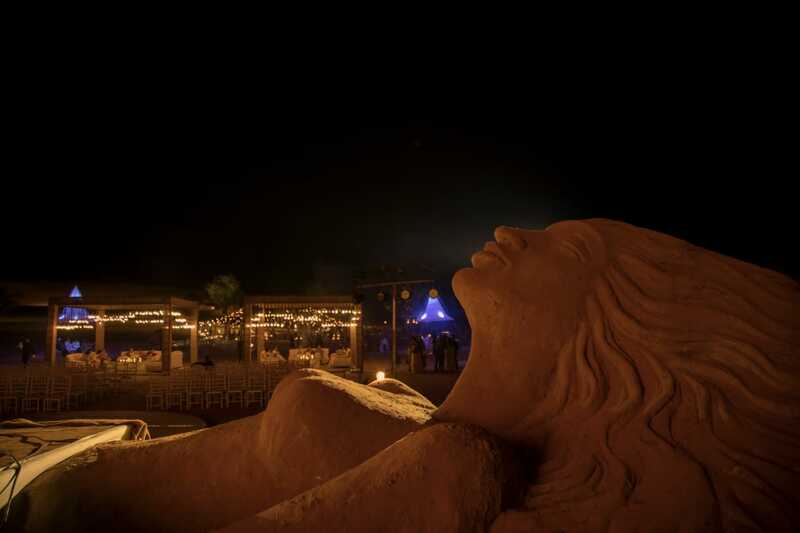 Another major décor attraction at the event was a giant sand sculptor. The quirky desert queen looked all giant and caught the attention of every guest. Entertainment and food are the two things that attract all the guests. Keeping up with the theme, Vinay and Anushree were clear about what they wanted. They went ahead with a mix of international and local artists and the result was spectacular. There were special dance and music performances by the artists of Rajasthan which included a special treat by famous folk artist, Vanadan Vadehra. For lending that international touch, Theme Weavers invited a Russian bartender, Alex to look after the guests. 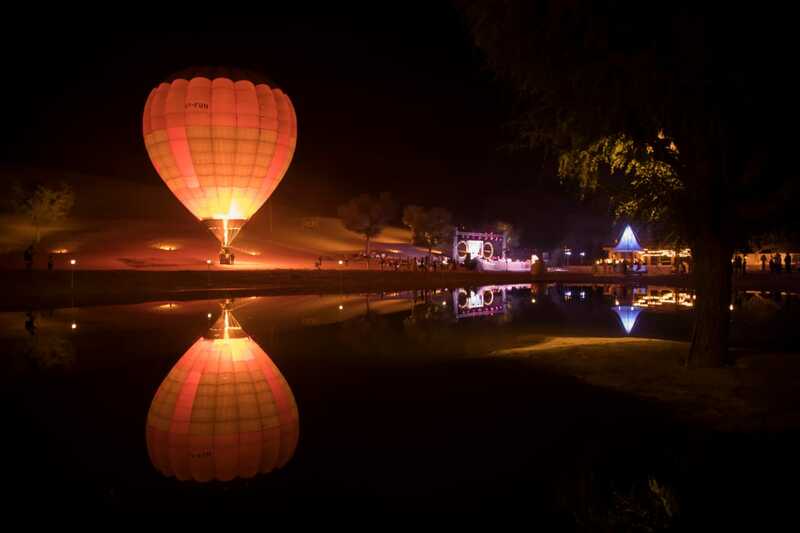 Another thing which glistened the eyes of the guests was the giant hot air balloon! Since the event was spread over a vast area, Theme Weavers decided to keep the food as exclusive as possible. Their caterer, Kitchen Craft, created a menu which was a mix of both international and local cuisines. There were different stations for dimsums, Malaysian satays, cheese, sushi and a special counter dedicated to Awadhi food. The on-the-go-food included idli skewers, champagne kulfi and three different flavours of Maggie. 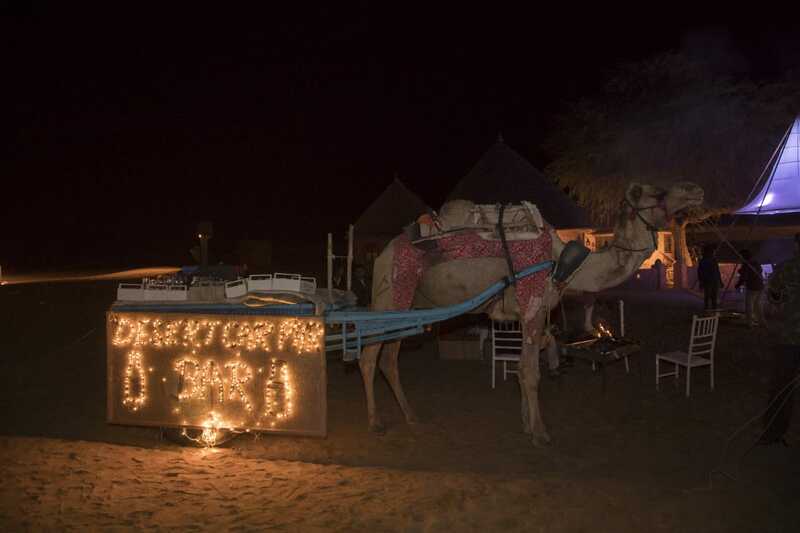 We loved the idea of having a moving bar on a camel cart! 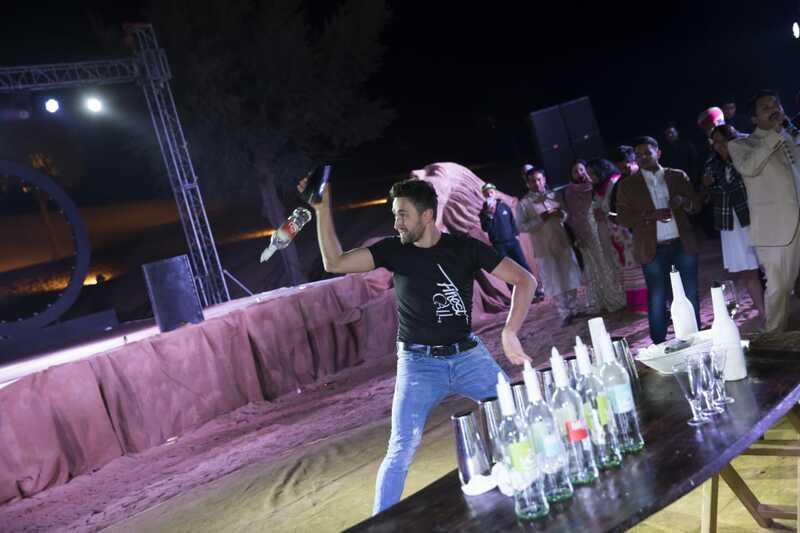 We cannot get over this unusual desert wedding. Who would have thought that deserts can be this versatile and fun? Every photograph speaks about the volume of happiness that the couple and their guests felt. Theme Weavers did a great job at converting a utopian idea into a reality!